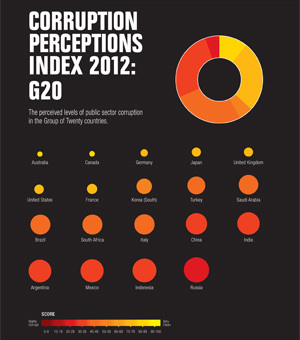 Is the G20 serious about fighting corruption? In the past weeks we have witnessed a great deal of news surrounding issues of transparency and accountability of multinational companies. In the UK, several international corporations including Starbucks, Google, and Amazon, have been questioned in Parliament over the little corporation tax they pay despite their large UK accounts. Tax evasion is facilitated by the same opaque international financial channels that support the laundering of the proceeds of corruption. Against this backdrop, it is interesting to consider the commitment of G20 countries expressed in the new Anti-Corruption Action Plan for 2013 – 2014. The good news is that they have pledged to meet the commit made at the last G20 summit to close the implementation and enforcement gap for anti-corruption legislation. They have also increased their focus on public sector integrity, which is commendable given G20 countries’ ranking on the Corruption Perceptions Index 2012. The bad news is that implementation and enforcement challenges are growing by the day. The failure of G20 members Germany, Japan and Saudi-Arabia to ratify the UN Convention Against Corruption and the lack of active enforcement by all G20 members are telling examples. Let us look at some more cases. Despite efforts by the G20 and the Financial Action Task Force many financial institutions – not only in offshore financial centres, but also in G20 countries – still remain safe havens for all types of illicit money — from corrupt officials, to tax-dodging companies, to criminals. In July 2012 the US Senate uncovered the services provided by HSBC to Mexican drug cartels, and the UK financial regulator enquiry in June 2011 highlighted the failure of many British banks to properly deal with the risk of handling the proceeds of corruption. Therefore, we look forward to the results of the horizontal reviews of the treatment of high-risk customers and business relationships the G20 is planning to undertake. To hold multinational companies to account on their tax payments, the G20 should mandate corporate reporting on profits and losses at country level as required by the Dodd Frank Act in the US and by draft EU legislation. In addition, automatic exchange of tax related information as opposed to on request would greatly facilitate international cooperation. Another enforcement challenge can be found in the area of combating bribery in international business. G20 members China,India,Indonesia and Saudi Arabia have not yet ratified the OECD anti-bribery convention. Transparency International’s 2012 Exporting Corruption? report found that only 7 out of the 37 signatories actively enforced the Convention. It is paramount that all G20 countries set up robust legal mechanisms in this regard and promote compensation to the victims of foreign bribery cases. A lot remains to be done for the G20 to be accountable on their pledge to enforce anti-corruption legislation and to not grant impunity for those who abuse entrusted power. Civil society is closely watching them. For more information please read civil society’s recommendations to the G20 in reaction to the new G20 Anti-Corruption Action Plan . ← Will billions in fines alone make banks respect the rules?